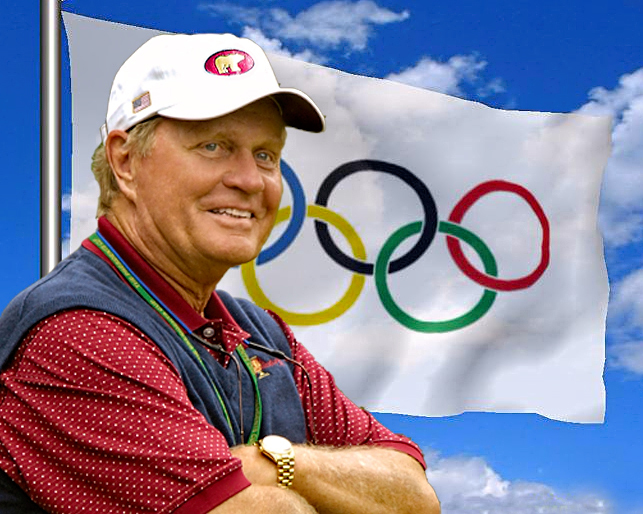 Golf is among the 41 sports included in the 2016 Olympic Games in Rio and along with it comes a chance to grow the game worldwide—an initiative record 18-time professional major winner Jack Nicklaus helped champion. Alongside the International Golf Federation in 2008, Nicklaus joined Annika Sorenstam to serve as Global Ambassadors for the movement, working in tandem with the Olympic Golf Committee and representing the effort at select international events in the year leading up to the IOC’s 121st Session in Copenhagen in October 2009. It was then that a vote was made in favor of reintroducing golf to the games. Now—eight years after becoming an ambassador—the Golden Bear, 76, will see golf included in the Olympics for the first time in his lifetime. The games get underway in Rio after this Friday’s Opening Ceremonies. Men’s and women’s events will tee off over the next two weeks to crown the first Olympic Golf champions in 112 years. Golf has only been on the Olympic program twice in the history of the games, in 1900 and 1904. At the 1900 games in Paris, two events were staged: one for men and one for women. Americans Margaret Ives Abbott and Charles Edward Sands were the first Olympic champions in the two events. In 1904 in St. Louis, the women’s event was replaced by a team event. “The reintroduction of golf to the Olympics represents a tremendous opportunity for the growth of golf in countries where it’s a developing sport,” Nicklaus said—his perspective uniquely gleaned from a global competitive career that spanned parts of five decades in addition to his work as a golf course designer in 41 different countries. “The Olympic games are a catalyst to ignite golf’s growth and identity as an Olympic sport which is tremendous for the game. And obviously to have the opportunity to represent the Olympic golf initiative with Annika was a true honor,” Nicklaus said. After a successful campaign and beginning this week, 120 players representing 41 countries now have the chance to bring home Gold, Silver, and Bronze medals for their countries. “As I reflect on my years of competitive golf, one of the most prized things that I had in my home was a medal display which included gold medals from the U.S. Amateur, from the U.S. Open, from tournaments on the Tour, from World Cups, and from other events. Those were all very, very prized to me. Money, you can take and spend, but a gold medal is something you keep forever and treasure the memory of it—it’s something to be very proud of. To represent your country in the Olympics and to win a gold medal for that is something that will probably grow stronger over time,” Nicklaus said. “I think the Olympics will have a great impact on the game, particularly if golf stays in the Olympics. They’ve got to put on a good show, and it’s got to be a good event. If it is, it will help the game grow greatly around the world,” he added. Full field lists of the men’s and women’s events are included below.